UTI Logistics Set Up Pkg. The Uriel Companies is a minority owned, asset based full service diversified Transportation Company. We offer all types of services from trucking, brokerage, logistics, less than truckload, independent agents, fleet service repairs, warehousing and cross docking services. 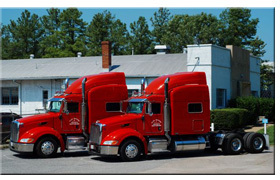 Our corporate offices are located in Richmond, VA.
We can move freight when others cannot and at competitive rates. Our confident staff, with over 150 years of combined experience can move a load of any type to anywhere and at anytime. A friendly employee is always on the other end to assist you in all your transportation needs. We are in the business to save you time and money while performing at a service level you would expect from a top rated company. UT Fleet Repair Services, Inc.
Superior performance at competitive rates, accurate and focused responsiveness from an experienced management team. We are just a friendly phone call away. Call us and see what we can do for you. Copyright © 2012. Uriel Trucking, Inc. UTI� Logistics, Inc. UTI� Fleet Repair Service, Inc. All rights reserved. Photography By: John Michael Fulton. Website Hosted and Developed by Hanover Hosting, LLC.